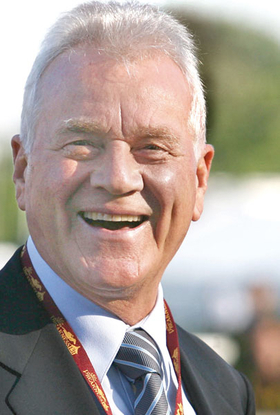 Magna founder Frank Stronach loves soccer, horse racing and hard work. TORONTO/PARIS (Reuters) -- Magna International Chairman Frank Stronach, who left Europe a virtually penniless toolmaker more than 50 years ago, is returning to fashion an automaking dynasty after clinching a deal for Germany's Opel. The 76-year-old Magna founder -- a rags-to-riches tycoon with a passion for soccer, hard work and fast horses -- emigrated to Canada at 21 with $200 and a suitcase. The son of a labor rights activist father and a factory worker mother, Stronach left school at 14 to become a tool and die apprentice at a factory in Weiz, the town in the southeastern foothills of the Austrian Alps where he was born. His personal fortune is now estimated at more than $1 billion, but when he arrived in Canada, Stronach's first job was peeling potatoes and washing dishes in a hospital kitchen. "I experienced what it was like to be hungry, to be discriminated against and to be treated unfairly," Stronach has said. He now prides himself on treating his work force well. Staff receive a share in company profits and individual plants are run as independent entities. After a string of rejections, Stronach got his break with the small tool and die company he went on to manage. Now, more than half a century later and in the middle of an unprecedented crisis for the automotive industry, Stronach is setting his sights on Europe and Russia through the long-established German brand General Motors is cutting off as it battles for survival. Stronach was pitted against Fiat S.p.A. in a run-off after fellow bidder RHJ International was ruled out of the race. Stronach is betting firmly on the future, hoping to grab an initial 20 percent slice of a market that was until recently expected to overtake Germany as Europe's biggest this year or next: Russia. The company that started out in a Toronto garage more than five decades ago may emerge as a major player in the cutthroat western European auto market, competing against the likes of Fiat, BMW AG and Volkswagen AG , all of which Magna currently counts as customers. Stronach's reputation as a fair boss led Opel labor leaders to favor Magna's bid early on, but comments on possible job cuts and plant closures made by the group's co-CEO caused outrage. Magna, the world's fourth-largest automotive parts supplier by revenue, whose headquarters sit amid rolling Ontario farmland 50 kilometers north of Toronto, is partnering with Russia's largest lender Sberbank on the 700 million euro Opel bid. Russia's second-largest carmaker, GAZ Group, is on board as an industrial partner under the plan. Stronach is married with two children. His daughter, Belinda, is a former member of parliament in Canada and currently serves as Magna's executive vice chairman. Son Andrew is involved in thoroughbred horse racing, a passion shared with his father. Stronach senior set up Magna Entertainment Corp., which owns and operates racetracks in the U.S. and Austria, but which earlier this month filed for Chapter 11 bankruptcy protection. "There's a big legacy thing going on here," said IHS Global Insight auto analyst Tim Urquhart, about Magna's Opel bid. "I think he wants to turn himself into a big OEM (original equipment manufacturer) ... and this will be a sort of legacy to his company." After clinching the deal in the early hours of Saturday morning, the man who started out working 16-hour days, sleeping next to his lathe in a Toronto garage, has secured a place in history for his company. And if his bet pays off, Magna may find itself jockeying for pole position once the auto industry bounces back.